We know it’s early, but you’ll need time to make your ornaments. 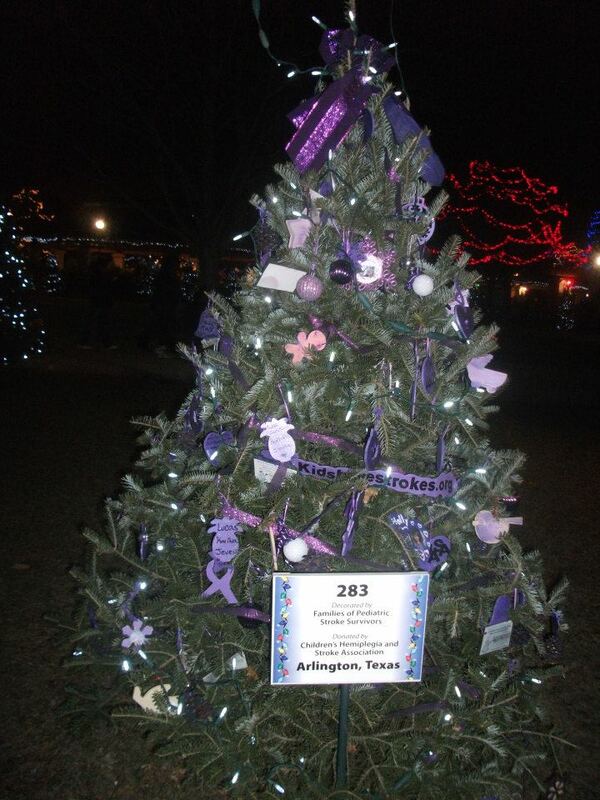 A few years ago, Tiffaney Carlisle, the mom of a pediatric stroke survivor from Illinois, approached the Children’s Hemipelgia and Stroke Association (CHASA) about sponsoring a pediatric stroke awareness tree at the Brookfield Zoo. The CHASA board thought it was a great idea, so we ordered a tree. 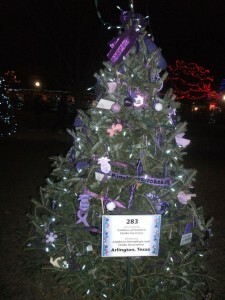 The tree was seen by thousands of people and was a great way to spread the word that Kids Have Strokes, Too. CHASA has sponsored this project for years. Click on the photo for a better view of the tree. You can set up a similar project in your community. It’s an easy and fun way to raise awareness and funds to help our little stroke or hemiplegic cerebral palsy survivors. Think of a highly visible location for your tree – shopping center, doctor or dentist office, veterinary office, your employer’s building, schools, places of worship, restaurants, local mom and pop businesses or larger box stores if they’ll allow. If someone tells you they have to check with the corporate office, you probably don’t have time to wait on that, so move on to another location. Buy a tree – size isn’t as important as the message, so do what works for you and your location. Or, donate your old tree and buy yourself a new one. Make the ornaments. Purple for pediatric stroke awareness. Or, green for hemiplegic cerebral palsy awareness. Or, both. It doesn’t matter. Matching lights are great if you can find them. Mix in some ornaments that have facts written on them. See the CHASA website for facts on pediatric stroke and hemiplegia. You could print out fact sheets if there’s a convenient place for those. If your tree is outside, make ornaments that will hold up during bad weather. You could host an ornament making party at your home, other social group, place of worship, work, or even at your child’s school. Nice opportunity for doing some educating during the party as well. Set up a sign on or near the tree with the name of our group, Children’s Hemiplegia and Stroke Association. Add a note that if people want to donate to benefit CHASA. Add the link to the website, www.CHASA.org. If you’d like to make this into a more personalized awareness and fundraising event, you can set up a page on Crowdrise and share your child’s story. Include a photo of your child or family with tree when it’s finished – just for fun. Save your ornaments and tree for next year! Do you have more ideas to help us with this project? Send them to us on the Contact Us form.